The plane had yet to take off, but Osgood, the photographer, was already snoring softly. He was in the center seat, wedged between John Thigpen and a woman in coffee-colored stockings and sensible shoes. He listed heavily toward the latter, who, having already made a great point of lowering the armrest, was progressively becoming one with the wall. Osgood was blissfully unaware. John glanced at him with a pang of envy; their editor at The Philadelphia Inquirer was loath to spring for hotels and had insisted that they complete their visit to the Great Ape Language Lab in a single day. And so, despite seeing in the New Year the night before, John, Cat, and Osgood had all been on the 6 a.m. flight to Kansas City that same morning. John would have loved to close his eyes for a few minutes, even at the risk of accidentally cozying up to Osgood, but he needed to expand his notes while the details were fresh. John’s knees did not fit within his allotted space, so he turned them outward into the aisle. Because Cat was behind him, reclining his seat was not an option. He was well aware of her mood. She had an entire row to herself—an unbelievable stroke of luck—but she had just asked the flight attendant for two gins and a tonic. Apparently having three seats to herself was not enough to offset the trauma of having spent her day poring over linguistics texts when she had been expecting to meet six great apes. Although she’d tried to disguise the symptoms of her cold ahead of time and explain away the residual as allergies, Isabel Duncan, the scientist who had greeted them, sussed her out immediately and banished her to the Linguistics Department. Cat had turned on her legendary charm, which she reserved for only the most dire of circumstances, but Isabel had been like Teflon. Bonobos and humans share 98.7 percent of their DNA, she’d said, which makes them susceptible to the same viruses. She couldn’t risk exposing them, particularly as one was pregnant. Besides, the Linguistics Department had fascinating new data on the bonobos’ vocalizations. And so a disappointed, sick, and frustrated Cat spent the afternoon at Blake Hall hearing about the dynamic shape and movement of tongues while John and Osgood visited the apes. John and Osgood exchanged a silent, relieved glance when they got their seat assignments for the trip home. John didn’t know Osgood’s take on today’s experience—they hadn’t had a moment alone—but for John, something massive had shifted. He’d had a two-way conversation with great apes. He’d spoken to them in English, and they’d responded using American Sign Language, all the more remarkable because it meant they were competent in two human languages. One of the apes, Bonzi, arguably knew three: she was able to communicate by computer using a specially designed set of lexigrams. John also hadn’t realized the complexity of their native tongue—during the visit, the bonobos had clearly demonstrated their ability to vocalize specific information, such as flavors of yogurt and locations of hidden objects, even when unable to see each other. He’d looked into their eyes and recognized without a shadow of a doubt that sentient, intelligent beings were looking back. It was entirely different from peering into a zoo enclosure, and it changed his comprehension of the world in such a profound way he could not yet articulate it. 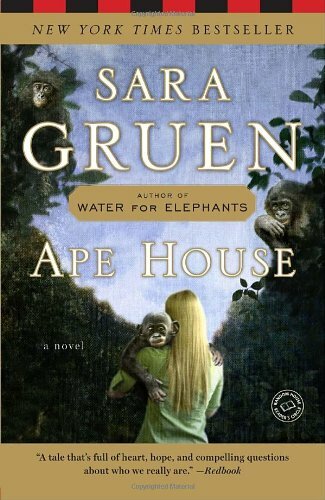 Being cleared by Isabel Duncan was only the first step in getting inside the apes’ living quarters. After Cat’s banishment to Blake Hall, Osgood and John were taken into an administrative office to wait while the apes were consulted. John had been told ahead of time that the bonobos had final say over who came into their home, and also that they’d been known to be fickle: over the past two years, they’d allowed in only about half of their would-be visitors. Knowing this, John had stacked his odds as much as possible. He researched the bonobos’ tastes online and bought a backpack for each, which he stuffed with favorite foods and toys—bouncy balls, fleece blankets, xylophones, Mr. Potato Heads, snacks, and anything else he thought they might find amusing. Then he emailed Isabel Duncan and asked her to tell the bonobos he was bringing surprises. Despite his efforts, John found that his forehead was beaded with sweat by the time Isabel returned from the consultation and informed him that not only were the apes allowing Osgood and him to come in, they were insisting. She led them into the observation area, which was separated from the apes by a glass partition. She took the backpacks, disappeared into a hallway, reappeared on the other side of the glass, and handed them to the apes. John and Osgood stood watching as the bonobos unpacked their gifts. John was so close to the partition his nose and forehead were touching it. He’d almost forgotten it was there, so when the M&M’s surfaced and Bonzi leapt up to kiss him through the glass, he nearly fell backward. Although John already knew that the bonobos’ preferences varied (for example, he knew Mbongo’s favorite food was green onions and that Sam loved pears), he was surprised by how distinct, how differentiated, how almost human, they were: Bonzi, the matriarch and undisputed leader, was calm, assured, and thoughtful, if unnervingly fond of M&M’s. Sam, the oldest male, was outgoing and charismatic, and entirely certain of his own magnetism. Jelani, an adolescent male, was an unabashed show-off with boundless energy and a particular love of leaping up walls and then flipping over backward. Makena, the pregnant one, was Jelani’s biggest fan, but was also exceedingly fond of Bonzi and spent long periods grooming her, sitting quietly and picking through her hair, with the result that Bonzi was balder than the others. The infant, Lola, was indescribably cute and also a stitch—John witnessed her yank a blanket out from under Sam’s head while he was resting and then come barreling over to Bonzi for protection, signing, bad surprise! bad surprise! (According to Isabel, messing with another bonobo’s nest was a major transgression, but there was another rule that trumped it: in their mothers’ eyes, bonobo babies could do no wrong.) Mbongo, the other adult male, was smaller than Sam and of a more sensitive nature: he opted out of further conversations with John after John unwittingly misinterpreted a game called Monster Chase. Mbongo put on a gorilla mask, which was John’s cue to act terrified and let Mbongo chase him. Unfortunately, nobody had told John, who didn’t even realize Mbongo was wearing a mask until the ape gave up and pulled it off, at which point John laughed. This was so devastating that Mbongo turned his back and flatly refused to acknowledge John from that point forward. Isabel eventually cheered him up by playing the game properly, but he declined to interact with John for the rest of the visit, which left John feeling as if he’d slapped a baby. John looked up to find a man standing in the aisle, unable to move past John’s legs. John shifted sideways and wrangled them into Osgood’s space, which elicited a grunt. When the man passed, John returned his legs to the aisle and as he did so caught sight of a woman three rows up holding a book whose familiar cover shot a jolt of adrenaline through him. It was his wife’s debut novel, although she had recently forbidden him from using that particular phrase since it was beginning to look as though her debut novel was also going to be her last. Back when The River Wars first came out and John and Amanda were still feeling hopeful, they had coined the phrase “a sighting in the wild” to describe finding some random person in the act of reading it. Until this moment it had been theoretical. John wished Amanda had been the one to experience it. She was in desperate need of cheering up, and he’d very nearly concluded that he was helpless in that department. John checked for the location of the flight attendant. She was in the galley, so he whipped out his cell phone, rose slightly out of his seat, and snapped a picture. The drinks cart returned; Cat bought more gin, John ordered coffee, and Osgood continued to rumble subterraneously while his human cushion glowered. Similar to chimpanzees in appearance but with slimmer build, longer limbs, flatter brow ridge. Black or dusky gray faces, pink lips. Black hair parted down the center. Expressive eyes and faces. High-pitched and frequent vocalizations. Matriarchal, egalitarian, peaceful. Extremely amorous. Intense female bonding. Although John had known something of the bonobos’ demonstrative nature, he had been initially caught off-guard at the frequency of their sexual contact, particularly between females. A quick genital rub seemed as casual as a handshake. There were predictable occurrences, such as immediately before sharing food, but mostly there was no rhyme or reason that John could ascertain. ID:So this is the part where we talk about me? ID:[nervous laugh] Great. Can we talk about someone else instead? ID:I was afraid of that. JT:So what made you get into this type of work? ID:I was taking a class with Richard Hughes—he’s the one who founded the lab—and he talked a little about the work he was doing. I was utterly fascinated. JT:He passed away recently, didn’t he? JT:So anyway, this class. Was it linguistics? Zoology? JT:Is that what your degree is in? ID:My first one. I think originally I thought it might help me understand my family—wait, can you please scratch that? ID:That bit about my family. Can you take it out? ID:[makes gesture of relief] Whew. Thanks. Okay, so basically I was this aimless first-year kid taking a psychology class, and I heard about the ape project and I went, and after I met the apes I couldn’t imagine doing anything else with my life. I can’t really describe it adequately. I begged and pleaded with Dr. Hughes to be allowed to do something, anything. I would mop floors, clean toilets, do laundry, just to be near them. They just . . . [long pause, faraway look] . . . I don’t know if I can say what it is. It just . . . is. I felt very strongly that this was where I belonged. ID:Not quite. [laughs] He told me that if I took a comprehensive linguistics course over the summer, read all his work, and came back to him fluent in ASL he’d think about it. ID:[seems surprised] Yeah. I did. It was the hardest summer of my life. That’s like telling someone to go off and become fluent in Japanese over four months. ASL is not simply signed English—it’s a unique language, with a unique syntax. It’s usually time-topic-comment-oriented, although like English, there’s variability. For instance, you could say [starts signing], “Day-past me eat cherries,” or you could say, “Day-past eat cherries me.” But that is not to say that ASL doesn’t also use the subject-verb-?object structure; it simply doesn’t use “state-of-being” verbs.